Why was Coach Mary Beth Chambers, asked to step down as the St. Rose coach on December 1st, is a question many are asking. When you hear explanation your jaw will drop. This is a clear example of a lack of common sense or worse Empathy on the part of NJSIAA. The NJSIAA is responsible for thousand of kids and programs. So it hard to take each case, case by case. But sometimes an organization has look at the repercussions of their decisions. In the case of ST. ROSE and Mary Beth Chambers they need to take a good hard look. On or about April 11th this year. Joe Whalen resigned as the coach of. St. Rose after winning the SCT CHAMPIONSHIP. His resignation shocked many in the Shore basketball community, nobody saw this coming, including Mary Beth Chambers. Meanwhile Mary Beth Chambers was coaching her AAU TEAMS. She is perhaps the most successful and most well thought of AAU coach in the area. She has been an AAU coach for 16 years. Over the years she been offered numerous college and high school jobs. In fact it was she that was offered the St. Rose prior to Coach Whalen being hired. Her daughter was playing at the U Penn and winning Ivy League titles. Miss Chambers had zero interest in the St. Rose job or any other coaching position at the time. She was most interested in sharing in her daughter’s college experience. Mary Beth Chambers coaches two AAU high school teams. Her teams in most years make up players from schools across the Shore Conference , this year was no different. When a player left her team in March, a unknown St. Rose player asked if she could join her team. Under coach Whalen the St. Rose players were pressured to play together in the spring and summer. This young lady took a risk and joined Mary Beth Chambers AAU team. She knew full well it could affect her status on St. Rose the up coming season, but she barely played for the high school so she was not concerned. She did not know or have a previous relationship with Mary Beth Chambers. A friend told her to contact Mary Beth Chambers…and here is where all the problems started. Now that Joe Whalen had resigned, St. Rose was in need of a coach. While Mary Beth Chambers was well into coaching her AAU teams. In May when St. Rose posted the head coaching position and with her daughter’s playing days over, Mrs Chambers decided to apply for the St. Rose position. She was interviewed in early June and hired on June 22nd. She started practicing with the St. Rose team at that point…this is allowed. She also coached her team in July …this too is allowed. Then she coached her team until September 1st..this too is allowed. There were no rules broken or bent to the best of anyone’s knowledge. Everything was done in the open and it appeared a new area was beginning at St. Rose. That was until October when St. Rose was informed about a rule that few coaches or AD’s know about …the 365 rule. This rule says no coach can have contact on the court with a player in the off season. If they do, they must sit 365 days. Now, I’m sure you asking how does this rule apply to Mrs Chambers? She was not named as the coach at ST. ROSE until late June, when she was allowed to coach her team. Meanwhile other teams had been practicing for weeks. She coached one player from St. Rose in April and May before the St. Rose job was even posted. Let me explain the 365 rule, but first let tell you why the rule is in place. The 365 rule is in place to prevent high school coaches from coaching kids year round. Next it is in place to prevent a school from hiring a AAU coach for example and having his AAU team enroll at the school. There are others reasons but let’s stick with that for now. When MARY BETH CHAMBERS coached the one player from St. Rose she was not yet the St. Rose coach. In fact she was 3 months away from being hired as the ST. ROSE COACH. Now your asking how in the world could she have known she was to be the St. Rose coach? She didn’t. A better question would be…since she coaches kids from so many schools, does that mean if any of those positions at those schools opened this year, she could not be hired? This is where the NJSIAA was not paying attention or didn’t take the time to know the history of the hiring. It’s wrong to ask MARY BETH CHAMBERS and St. Rose TO BE mind readers and predict the future. Two questions should have been asked. Was Mary Beth Chambers trying to get a athletic advantage and did she break the sprit of the rule?…the answers are obvious to both. 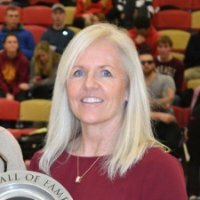 This is a women who is in the Hall of Fame at the school and her daughter like her won a State title. There was zero malice or trying to beat the system. But what is most disturbing about this entire case is this. Why did the NJSIAA accept St.Rose’s corrective action plan after self reporting and considered the matter closed? Then only to come back and tell her she could not coach her team? This leads me to believed something fishy has gone on. Like a another school, AD or coach not playing within the sprit of high school sports or the sprit of the 365 rule. This should have been a one minute discussion by the NJSIAA to reinstate Coach Chambers, the moment they heard the facts. Yesterday College coaches and high school coaches were calling the entire thing a disgrace. In all my years I have never seen anything like this..nor has anyone else. The young lady involded from St. Rose feels horrible. The person who did everything right, should not be caught up in semantics of the 365 rule…that person would be MARY BETH CHAMBERS. The NJISAA should restore MARY BETH CHAMBERS NOW. The school and the players deserve more and The NJISSA must not focus on trying to be right…BUT RATHER DO RIGHT. Hopefully everyone will be cheering the NJSIAA real soon. ← A SOUTH IS TRN’S TO LOSE!